The Fliptime Machine is a fully immersible device using, visual, audible, motion and participatory elements that when mixed together, open pathways in the space time continuum and allow the traveler to see events as they took place in the past. Join us for a ride to the past and beyond!!!! The Chalkboard Art Car will be back at Utopiafest this year for your scribbling pleasure. Find the 1981 Chevy El Camino on the festival grounds throughout the weekend! The DRUNKLUCK Motel is designed as a surrealist homage to one of the most quintessential American traditions: the budget motel. By merging physical, visual and theatrical elements - the DRUNKLUCK MOTEL will provide festival-goers with a familiar space - reimagined in a surrealist way that encourages connection and creation. 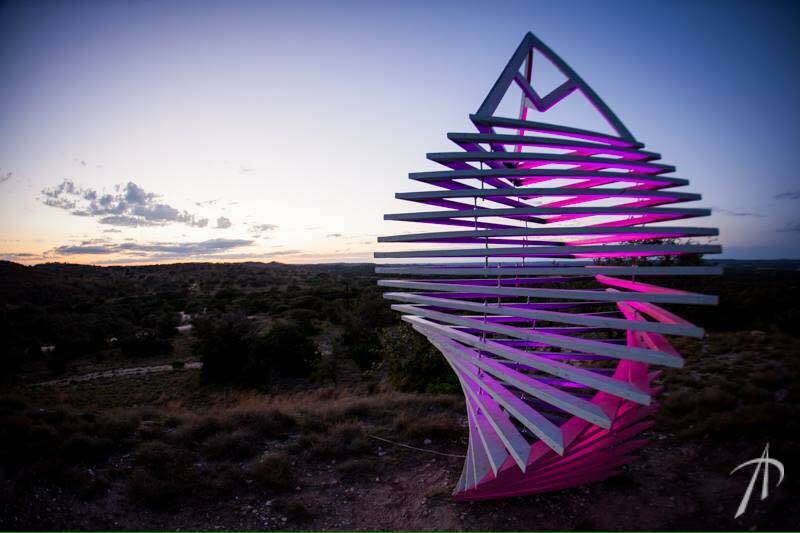 Sacred Tribe will be bringing out their large multicolored sculpture consisting of individual triangular polygons framed out of wood that stack upwards while uniformly twisting in a helical path. Come climb and experience this multi-layered art piece. Sacred tribe is an Austin-based collective that produces art, sculpture, and jewelry. String Theory Art Installation - Amazing yarn-based fence murals and multi layered sculptures by the amazing folks at Start Productions. Because of the Lotus symbiotically fuses fine art with digital art, while creating a space where the art can be viewed as a new medium with the viewer being fully immersed in the piece. Paintings, murals and other inanimate objects are brought to life using the arts of Projection Mapping, 3D and 2D animation, Laser Projection, and now Virtual Reality. The use of biofeedback equipment, specifically a wireless EEG headset, allows participants to control the digital art based on brainwave pattern. Two or more telephones that only talk only to each other. These telephones are simple to set up simply connected by wire and requiring no power. The US Navy uses these and they can clearly communicate up to 5 miles apart. Live Art - by the amazing Ami of GonzoViz.com. 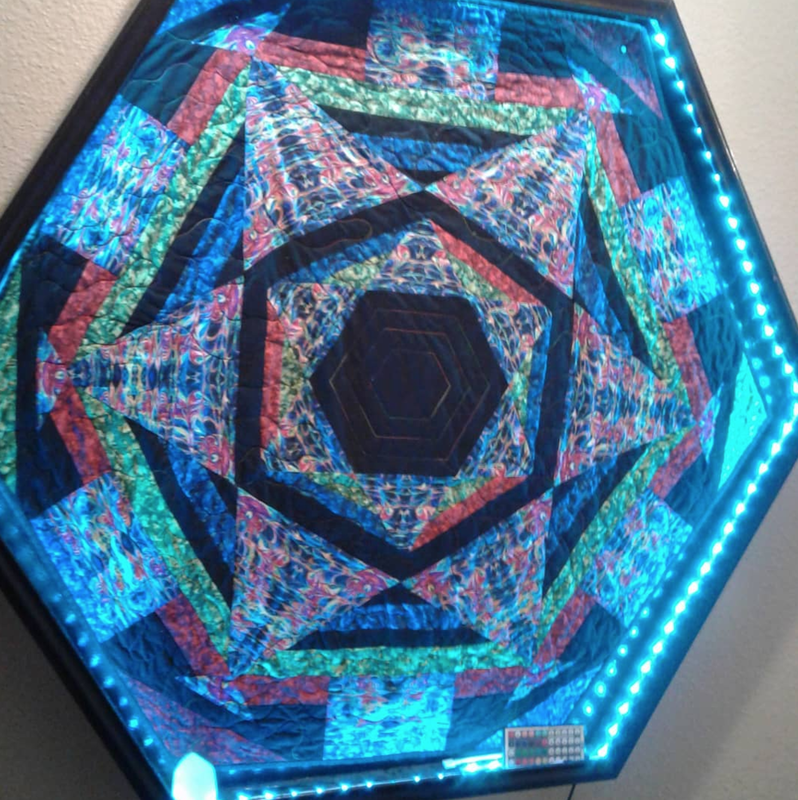 Hand-sewn quilts with color changing led lights in the frame.. as the lights change color the fabric changes and warps! Come one, Come all! But not all at once. Bring your instruments and step right up to experience the Magick Solar Suitcases! The Magick Solar Suitcases are a completely solar powered, live, interactive experience where anyone can help create the next song on the spot! You can help make the next song by playing one of the Suitcases, grabbing the microphone, plugging in an instrument of your own or asking a question. You can find the Suitcases throughout the festival grounds. All are children of the immortal bliss, get your instruments! The Mesmerize Lounge by IECreatives is an outdoor pop-up art gallery constructed out of up-cycled materials from corporate event waste. Treat the art as photo backdrops and to take a load-off in the lounge at anytime during the festival. The wood and plastic crates have been salvaged and re-used. IECreatives is a team of artists based in Austin, Texas who produce multi-sensory & immersive installations for entertainers, brands, artists, agencies, and community organizations. 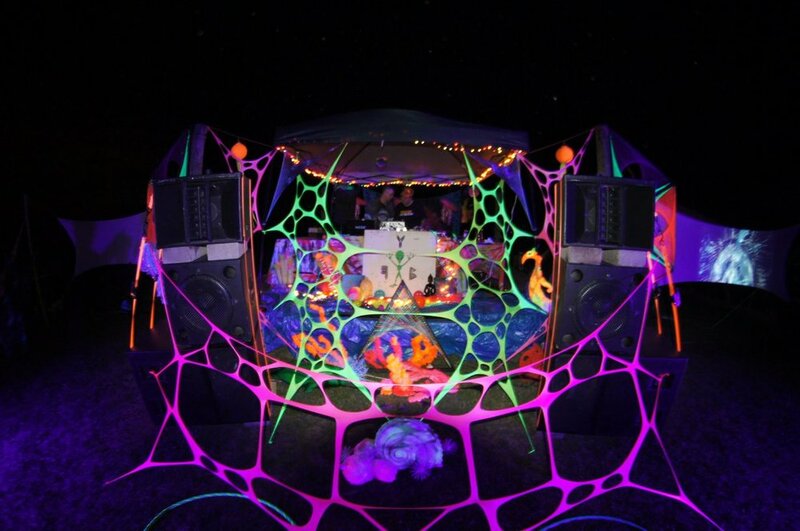 Spunshiine - Artist Haley Ashley is bringing her trippy laser cut fabric installations to UTOPiAfest! Witness radiant fire performances Friday and Saturday nights brought to you by Cherry Cola Dog. Bask in the beauty and relax in the beehive Honeycomb Dome by Ruthie Monroe! We are proud to offer a variety of workshops on art, massage, permaculture, acroyoga and so much more!